WHAT IS GAS AND ACIDITY? The term acidity is used by a common man to explain his gastritis condition. As gas is the problem which is not stable in one place and keeps on moving where it finds empty space. As per Ayurvedic concept Vata dosha is responsible for the movement of gas in the whole body. In the same way Pitta dosha is responsible for the acidity as it leads to heartburn, burps, flatulence, fatting, and loss of appetite. 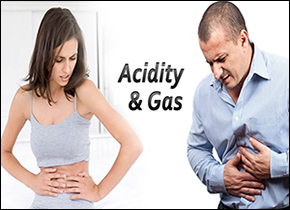 WHAT ARE THE SYMPTOMS SEEN WHEN YOU ARE SUFFERING WITH GAS AND ACIDITY? WHAT ARE THE CAUSES OF GAS AND ACIDITY? WHAT SHOULD BE THE DIET & LIFESTYLE TO BE FOLLOWED? One should avoid tea, coffee, and carbonated or alcoholic beverages. No for processed and fermented foods. Garlic, ginger, onions, tomatoes, and vinegar in cooking should be avoided. No for rich gravies, sour, salty, and spicy foods. Use of curd should be strictly avoided at night. Meals should be always in a relaxed atmosphere at regular intervals. Yoga and Pranayama such as Vajrasana, Bhujangasana, Salabhasana, Bhastrika Pranayama, Shitali Pranayama and Shitkari Pranayama should be practiced. WHAT ARE THE HOME REMEDIES WHICH ARE HELPFUL? Both of the herbs should be roasted and taken in powder (25 gm each) mixed with 50 gm of sugar. Half spoon of the powder to be taken 3 times a day to get rid of hyperacidity. Is categorized as a satvic food as per Ayurveda. It is very useful in giving relief from bloating, improves the digestion, and relives mild constipation. As Buttermilk contains lactic acid that normalizes acidity in the stomach. Sprinkle black pepper or 1 teaspoon of fresh ground coriander leaves for best and speedy relief. It is a fruit which is rich in potassium and is proved to be an excellent antidote to acidity as per its properties. Ripped banana can give you relief from the discomforting symptoms of acidity. When we drink coconut water the pH acidic level of your body turns alkaline. The intake of the water helps in the production of mucous which protect the stomach from harmful effect of acid formation. As it is rich in fiber also helpful in digestion and prevents re- occurrence of acidity. Drink coconut water once daily. Has excellent digestive, antioxidants and anti-inflammatory properties. It gives relief from gastrointestinal irritation. Ginger also reduces inflammation and manages symptoms of acid reflux. Chew a slice of ginger. Take a spoonful of ginger juice mixed in normal water drink this mixture two-three times a day. A slice of fresh ginger in a cup of boiling water and drink up. Jaggery is rich in magnesium which boost the intestinal strength of the body. It also improves the digestion and reduces the formation of gas and acidity. A piece of gur (Jaggery) to be taken after meal helps in digestion. Gur sharbat gives cooling effect to stomach. It is beneficial is preventing stomach acidity, indigestion, and bloating. Fennel has gastrointestinal benefits. Few fennel seeds to be soaked in water and drink up the water and chew on the fennel seeds to get immediate relief. Tulsi boosts mucus production in the stomach and has antiulcer properties. It is helpful in comforting the discomfort. Chew on 5-6 Tulsi leaves daily. Elaichi, or cardamom, is a multi-purpose remedy. It motivates digestion, reduces stomach contractions, soothes the stomach lining and prevents excessive acid production. Crush two shells of elaichi in boiling water and drink it for quick results. Cloves boost saliva production, which helps in digestion and reducing the symptoms of acidity. To get relief from acidity, just bite a piece of clove and keep it in your mouth. The oils released from the clove will help in reducing the acidity within no time. Also called the Indian gooseberry, Amla has high amounts of vitamin C in it, which helps in healing the agitated lining of the stomach and oesophagus. Take one teaspoon of gooseberry powder to prevent acidity. What Are The Herbal Remedies Which Are Helpful? 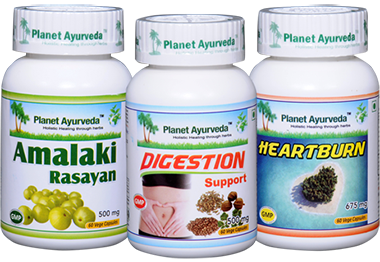 Planet Ayurveda offers the Ayurvedic medicines keeping in mind the Ayurvedic concept of the problem which are helpful in controlling the gas and acidity. Acidity care pack consists of popular and natural herbs that are used to treat gas and acidity. The effective herbal remedies helps to control and manage the causes and symptoms of gas and acidity. It's an herbal combination in form of capsules. The herbs used are Coral Calcium (Praval pishti), Agate calcium (Akik pishti), An Ayurvedic calcium compound (Jahar Mohra pishti), An Ayurvedic calcium compound (Kamdhudha Ras), Pearl Calcium (Mukta pishti), and Tinospora cordifolia (Giloy). The effect of the herbal medicine is cool which pacifies the pitta dosha. Maintains full digestive system. DOSAGE: 1 capsule twice daily with plain water after 30mins of meal. It's an herbal combination in form of capsules. The herbs used are Amalaki (Emblica officinalis), Haritaki (Terminalia chebula), Bibhitaki (Terminalia bellirica), Fennel (Foeniculum vulgare), Dhania (Coriandrum sativum), Pippali (Piper longum) and Jeerak (Cyminum cuminum). It is an herbal supplement which promotes and encourages the digestive system which reduces the formation of acidity. It is made from the extract of fresh Amla (Emblica officinalis). It increases the digestion, controls and reduces the gas and acidity. This herbal supplement also balances the pitta dosha of the body. We are using 100 % vegetarian capsules made from plant cellulose and not from hard gelatin. Standardized extracts is used in the preparation of herbal supplements. Products are free from chemicals, preservatives, starch, additives, colors, yeast, binders, fillers and etc. 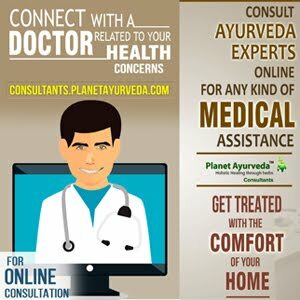 It’s formulated by MD Ayurveda experts.